For those in the UK, 27 September at 8pm is the second episode of Channel 5’s Heroes of the Skies. It features another “character” appearing in THE DECISIVE DUEl, George “Screwball” Beurling, of Verdun PQ, who was probably the last successful daylight “lone wolf” fighter pilot. 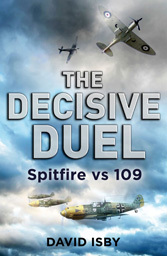 THE DECISIVE DUEL describes his key similarity to another well-known Canadian, Wayne Gretzky.